The school uniform debate is a polarizing issue, with school officials and educators on one side and kids and teens on the other. And parents? Well, most parents are just stuck in the middle. On the one hand, school uniforms can be less expensive than "regular" clothes; on the other hand, many parents want their kids to be able to express themselves through fashion. LoveToKnow Kids turned to image consultant, Dianne M. Daniels, AICI, for her take on the raging school uniform debate. Dianne offered her perspective on the need for school uniforms, as well as some tips for personalizing the outfits. According to Dianne, though, fashion is just one way kids and teens can express themselves. LoveToKnow (LTK): Please tell us about your background. Dianne Daniels (DD): I am a certified member of the Association of Image Consultants International, and have been a professional image consultant and coach for over 5 years. I work with male and female clients on issues concerning skin care, makeup, color analysis and clothing, wardrobe planning and maintenance, and personal shopping. LTK: What is your opinion of mandatory school uniforms? DD: School uniforms take away some of the pressures on students to conform to the current fashion trends and gives them a way to avoid overspending on clothing that will go out of fashion very quickly. It's also a way for a student who doesn't fit into a normal size range (either very tall, very short, very thin or heavier) to avoid being singled out for their lack of conformity regarding wardrobe trends. It makes things easier on parents who don't have unlimited clothing budgets for their children, as well, by making the clothing choices more restricted and hopefully less expensive than chasing current trends. LTK: Do you believe that school uniforms stifle students' individuality? DD: No. Even when you have identical twins, they have different personalities. Student can express their personality with accessories, the way they wear their hair, and for girls, how they wear makeup. It puts less importance on appearance and more importance on personality and internal characteristics, which actually might help students bring out those qualities that make them even more unique. LTK: How important is fashion to kids, tweens, and teens? DD: Fashion magazines, the music industry and popular culture have created a need among kids, tweens, and teens to have the latest article of clothing or an accessory so they will seem 'hip' or 'cool'. Advertising has also contributed to this phenomenon by attaching specific personality characteristics to clothing lines and accessories, so that students who want to exemplify those characteristics feel they must have the specific article of clothing that portrays that image. LTK: Do uniforms "level the playing field"? DD: With regard to appearance, yes. They give students who cannot afford the latest clothing or more expensive clothing a way out of those pressures. Some students of more modest means might suffer self-esteem issues because of their lack of more trendy clothing - school uniforms can help relieve that pressure. LTK: How can students add some personality to their uniforms? DD: That will depend upon the school's rules and flexibility regarding the uniforms. Differences in material, construction, fit, and finish can be accomplished relatively easily, but can cause additional problems. Allowing too much customization creates problems similar to allowing normal street clothing. Different colored accessories - blouses or shirts, vests, socks, and shoes - could allow for some expression of personality within normal boundaries and without encouraging a return to an over-dependence on expensive or designer items. LTK: What advice would you give to students in schools with very rigid dress codes? DD: Find ways to express your personality within the rules of the dress code. If certain items of clothing can be customized or altered, consider that first. A school uniform that fits your particular body frame as if made for you will give a better impression than a sack-like garment that's made to fit anybody. Small changes in the color of a shirt or blouse can also flatter a student's natural coloring in a way that an ordinary school uniform could not. LTK: Aside from clothing, are there other ways students can express their individuality? DD: Within reason, accessories like earrings and hair ornaments for girls, ties for boys, and hairstyles for both genders can help students express their individuality and still adhere to school rules. Unique tights, leggings, or socks. 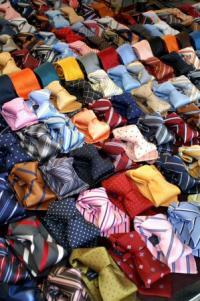 Colorful, creative ties for boys and girls. If allowed, ties can make great, stylish belts! Make sure to check your school's individual policies before attempting personalization.